Grandfather Frost was the original plan for Uncle Sweetshare, who was evidently changed prior to the release of the game for being just a bit too much like Santa Claus. He has a different song, and his Colovian Fur Helm was to be red instead of white. 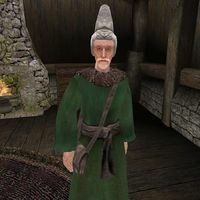 He's also Breton instead of Nord, and has a jolly white beard to boot. Actually, the helm is white, just like Uncle Sweetshare's. However, there is a Red Colovian Fur Helm listed in the construction set, which is not found anywhere in the game, but was obviously intended for him. Unfortunately, despite being called that, it is really just yellow, like a normal Colovian Fur Helm. Grandfather Frost is the Slavic name for the equivalent of Santa Claus. This page was last modified on 15 November 2018, at 19:39.